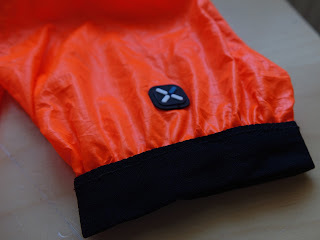 My Orange Brompton: B'TWIN 700 Ultralight Windproof Cycling Jacket In Orange!!! B'TWIN 700 Ultralight Windproof Cycling Jacket In Orange!!! 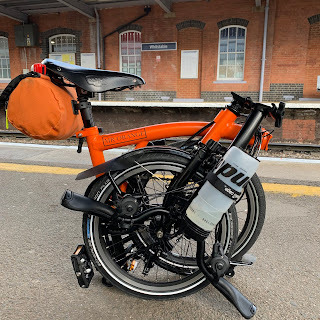 Some of you might remember that I posted a review of the Pearl Izumi Pro Barrier Lite CLICK HERE a couple of years ago. This jacket was okay but despite the fact it was incredibly lightweight, I have to report that for me that was its only redeeming feature. 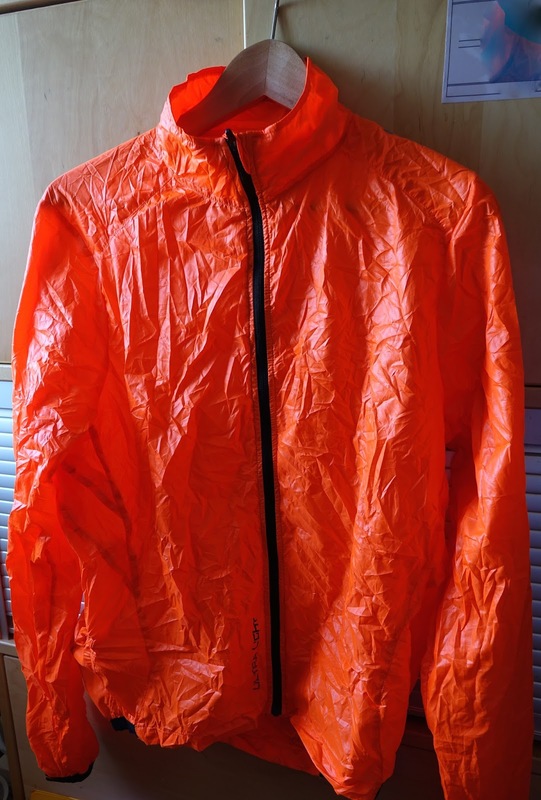 The B'TWIN 700 Ultralight Windproof Cycling Jacket weighs in at 91g but I have to say I didn't really detect that it was a little heavier that my Pearl Izumi. The B'TWIN 700 also has the added bonus of being able to pack itself into a small pocket on the bottom right of the jacket. Packed away it fits easily into the palm of your hand, could be stowed in a rear pocket or in a saddle bag. The actual jacket is a good close fit and again beats the Pearl Izumi which flapped around a little bit like a kite. The fabric which is apparently biosphere (whatver that is) in addition to being lightweight is windproof and I have to report that having used this at 03:58 a.m. outside Gatwick airport it certainly provided the warmth I needed at that ungodly hour. This is where a jacket like this excels. On night rides (and I do lots) you will have read about me being frozen after a halfway stop. This jacket will be brilliant for this purpose but also for times when the weather turns colder. Being so light and compact means that I would always carry it and not have to worry about it talking up space for weighing too much. The sleeves and part of the hem are elasticated and allow a good comfy fit without being overly tight. The zip looks like it can stand the test of time and it is nice to see that there is a park for it at the neck. This jacket isn't waterproof but it does allow protection from light drizzle. Think of it more as an extra layer though. Again Decathlon offer a two year guarantee on this and it costs £19.99. Bearing in mind the Pearl Izumi was more than double this price, it is again another bargain from Decathlon. The sell this jacket in a few colours white, blue and red and Decathlon will not be getting this one back now that I have reviewed it. I have provided a link directly to this item on the Decathlon website and again many thanks to Decathlon UK for allowing me to review this. My only regret is that this had of been around when I bought the Pearl Izumi! I have a kag in a bag from Millets, which is wetter inside than out when it rains. My aldi running jacket is ok though. Cheapskate!